It is not just ospreys in Glaslyn that are getting frisky. 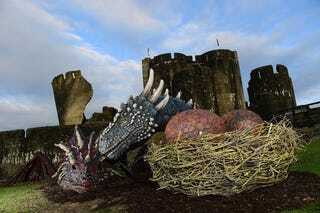 Dragons Dewi and Dwynwen have been joined by a couple of eggs at Caerphilly Castle in Wales. Perhaps they like the taste of the acid mined by The Flesh in Doctor Who? The two dragons have been flitting around castles over the last year or so. Could they be joined by more before the end of the year?